On 17- 21 September a five-day Negotiations skills training course took place in San Pedro Sula city (Honduras) for the StreetNet Affiliate FOTSSIEH (Federación de Organizacionesdel Sector Social y Informal de la Economia de Honduras). The Training was organized in partnership with the Solidarity Centre AFL-CIO in the framework of StreetNet -Solidarity Center Partnership Project. 30 FOTSSIEH local leaders and activists attended the training which aimed to strengthen the negotiating capacity of workers in the informal economy with the authorities; act to ensure effective institutional mechanisms and represent interests and defend projects and rights. The StreetNet program of the training course is designed in a way to target every single worker of informal economy including illiterate poor workers who do not know how to write and read. 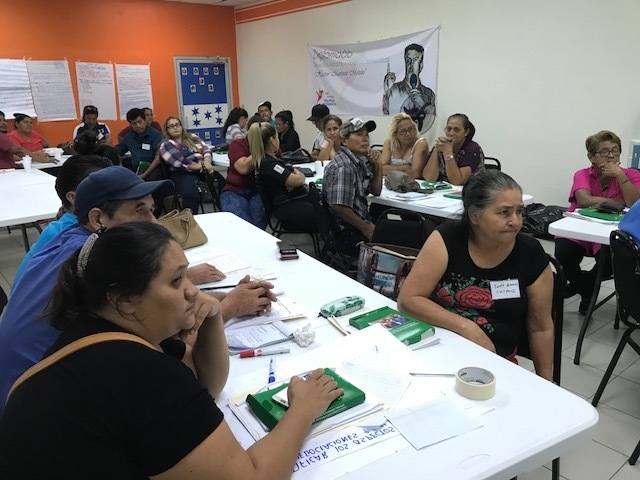 Pat Horn, StreetNet International Coordinator and Maira Vannuchi, StreetNet Organizer for the Americas facilitated the training which took place at the Convention Center of the Solidarity Center Office in San Pedro Sula. Stephen Wishart, Solidarity Center Director for Central America welcomed the participants of the event pointing on high level of informal economy in the region and need to build capacity on negotiations skills for workers representatives. Throughout the training the participants were working in small groups trying to identify the negotiations in which they are already involved; identify a proper counterpart for negotiations; developing strategies and tactics of negotiation; overcoming the obstacles of collective bargaining in the informal economy and developing future strategies and action plans towards negotiations for their organizations. One of the very positive and joyful activity was devoted to the Role Play as preparation for the field visits. There were two groups who immersed themselves in the staging and designed imaginary situations with interesting strategies. In the first group they chose to represent a case of restrictive police approach, but without violence. And they imagined an election period when the mayor was worried about the political campaign, knowing that it was a good time to have a good result. In this experience there was good dialogue with the mayor and involved the chamber of commerce in negotiation, which was a possible scenario. In the negotiation the group requested the ordering of the street vendors in the public spaces, but they did not claim a market taking advantage that they were reunited with the maximum authority, the Mayor. They were very contained in the negotiations. In group two the city hall arrives without legal orders, formal permission to do so and the police violently clears the space and evict the street vendors. The businessmen paid and bribed the city hall to evict. It was interesting to note that the union has been willing to help a worker even though he was not a member, which is an important point. We noticed that the counterpart split. And they remembered to leave with a signed document of what was agreed upon. It was a very successful strategy, because when the union only represents who is its member, a great division begins in the organization. To open the dialogue with the authorities requires maximum inclusion and joint work. The Field Visits have been arranged in advance by FOTSSIEH to visit three places of San Pedro Sula: City Hall, Market Medina and Market Dandi. The evaluation of the field visits experience, and a discussion of lessons learned, and observations was also very interesting and informative within the following day of the event. The participants shared a lot of information including all challenges and opportunities they faced as now they started to realize possible scenarios of both successful and failure negotiations. During next activity the participants gathered into groups to accomplish the task and think about strategies and tactics to overcome the obstacles identified. They pointed out the following ways of overcoming: dialogue, proposal, develop action plan, improve communication, more capacity to share knowledge, empowerment, strengthening of organizations, need to overcome authoritarianism, need to study counterpart before dialogue, listen to know the counterpart and analyze their ideas and perspectives. The groups met to consider the process of establishing a permanent space for dialogue and worked out the necessary procedure for its creation, emphasizing the need to be an inclusive, decision-making, broad space that is clear of its purpose and that, obstacles such as politicization and the practice of not complying with established agreements, as well as dealing with the different positions of the two parties. On the last day of the training a Municipal Councilor, Jose Antonio Rivera (Tonito) arrived in the training and introduced a pilot plan of municipal development as well as the construction of the public market that must be built soon. He also promised to talk to the Mayor to receive the FOTSSIEH representatives. At the end of the training the participants developed future strategies and plans on how they are going to prepare and to start the negotiation process with identified counterparts. The results of the plans and progress made will be measured and analyzed during the follow up workshop in 2019. It was a good opportunity to hold the training at that particular time as FOTSSIEH Leader Eugenio Rodrigez who just recently passed away, held much of the organization’s strategic and leadership skills, however, now everyone will have to learn how to run the organization without such a great leader.